Sing to shatter virtual glass. 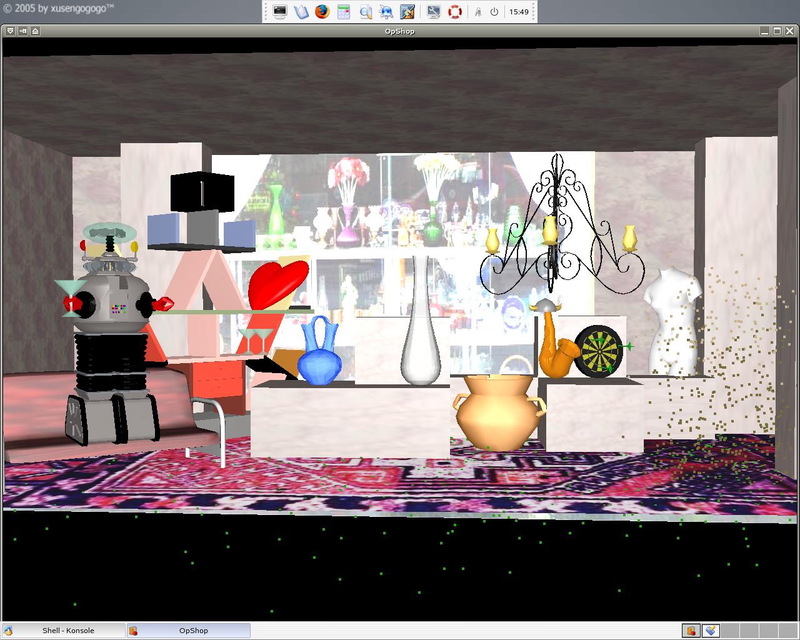 Cluttered from floor to ceiling with bric-a-brac, Op Shop is a virtual environment that is transformed by sound. A high-pitched wail can shatter glass, or by singing a low note, the user can smash a table, and clapping their hands can rattle many objects at once. Here is an image of the 2 Walled installation from the catalog for Experimenta’s International Touring exhibition titled Under the Radar which curated OpShop for shows at the Foundation for Art and Creative Technology (FACT) in Liverpool and the Institute for Contemporary Art (ICA) in London in 2006. This image is a screen shot from the version of OpShop that was developed and selected for the Experimenta exhibition titled Prototype in Melbourne in 2002. Here is a video of the first version of OpShop that was developed for the 4 wall stereo back-projected Cyberstage in the Virtual Environments research group at the Fraunhoffer Institute in Bonn in 1998, and shown in an exhibition of Virtual Environments at the Animax Mltimediatheatre in Bad Godesburg in 1999. And finally here is an image of first prototype which was called Bad Choir at the time.